Saturday was the day. The weather was beautiful, the neighbors, friends & family showed up and the signs were right with the universe – so we branded. This was actually the 3rd branding of the season but this is the one I love – it’s when we brand the new babies and we get to see just how good they are doing. First we gathered the calves and cows. We keep them in the small pasture near the house so we can keep a close eye on them as they are being born and it makes it easy to push them into the horse pasture and finally the corrals. Here’s our boys bringing up the rear with the last cow and calf. 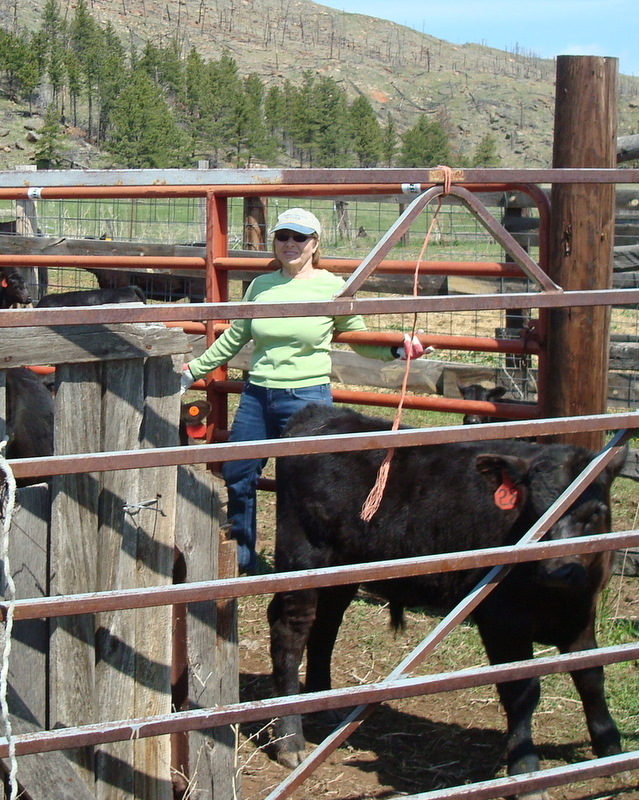 Once we get them into the corral we sort the cows off of the calves and the bawling begins. First we run the cows through the big chute where they got a couple of shots and some pour on insecticides to help control the bugs that annoy. Then the moms are all right there and waiting when the babies get done. And talk about babies here’s one really cute baby and her two big brothers. A couple of the neighbors showed up to help. 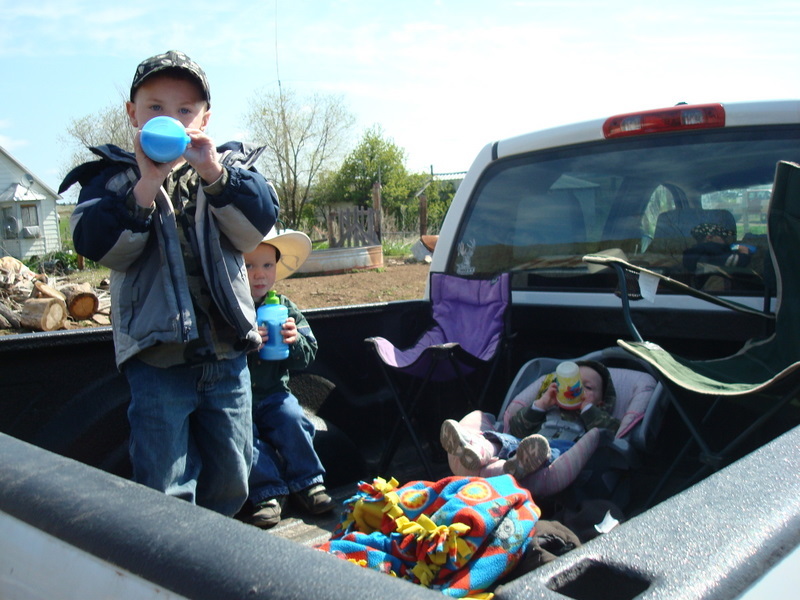 This is Amy’s kids in their ‘ranch kid play pen’. I tell you – we have nothing but the best for our kids – that’s probably a $40,000 Dodge play pen. All the comforts of home and lots of good fresh air and sunshine. 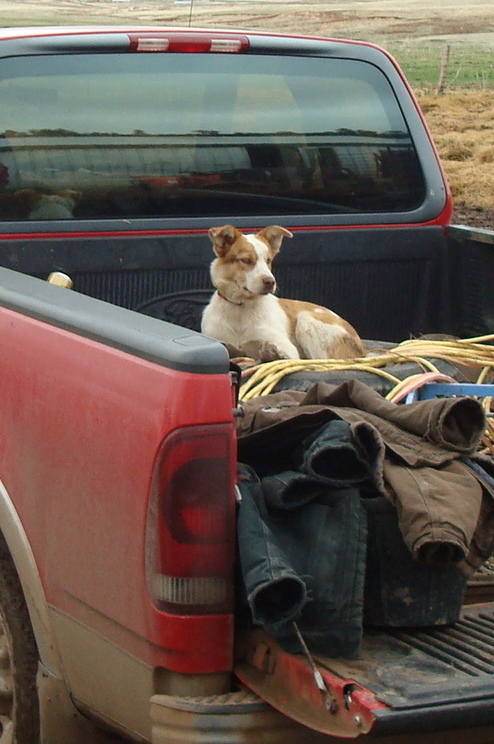 Wade – Morgan’s truck-driving buddy showed up to help too. John – the cowboy poet and all around nice guy showed up too and he brought his wife Ellen who is just the sweetest lady you ever want to meet. She’s a tiny little thing but she don’t back down when it comes to calves that probably out weigh her by 50+ pounds. I think she was even having fun. And who’s this yahoo with the lime green gloves and the strange pair of pliers? Yes, it’s me. Looks like I’m ready to tackle a sink full of dirty dishes but actually I had the job of putting in the fly tags. These are ear tags that will help keep the flies away from the calves. The thing to remember with fly tags is you do not want to handle them without rubber gloves – it will make you sicker than a dog but on the bright side you would probably never need to worry about flies bothering you again. 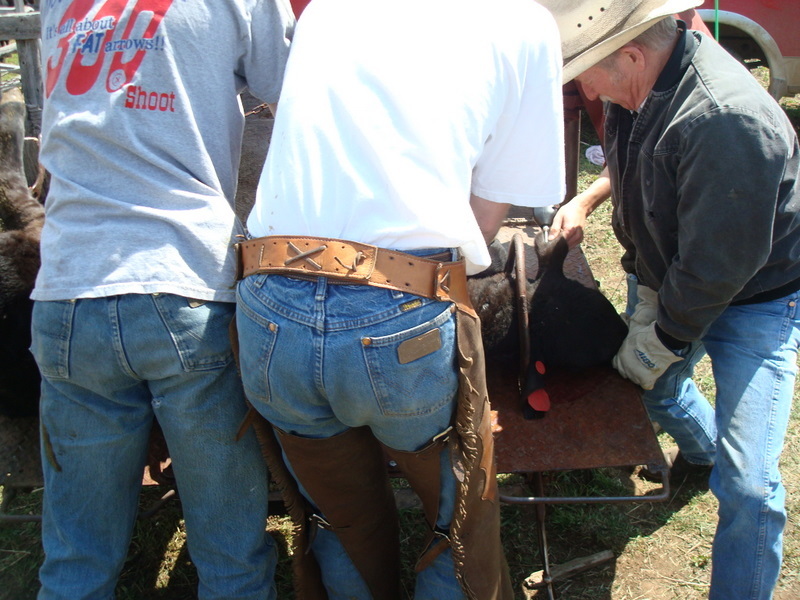 Since I was trying to stay out-of-the-way most of the time this is the view I had of the calves on the calf table. I did move out of my little corner by the table once in awhile and did get some better shots. And Morgan did the cutting (castrating). What can I say – some people just have the knack for it and Morgan is good. And this little guy was watching our backs. If any calf, cow or cowboy strayed close enough he was ready. Just give him a couple more years and he’ll be right out there with the rest of them just like Dally who really, really wanted to help. And here’s Dani on her favorite horse Taz. What a great team. When it comes to branding or just about any big job Grandma Winter’s advice rings true. 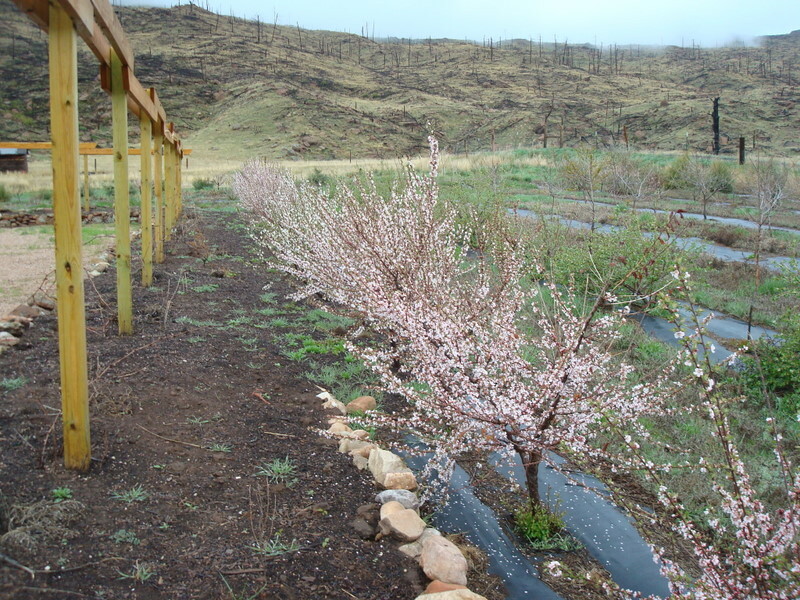 Spring is definately here and at this ranch that means it’s time to buy yearlings. Yearlings are last years calves. 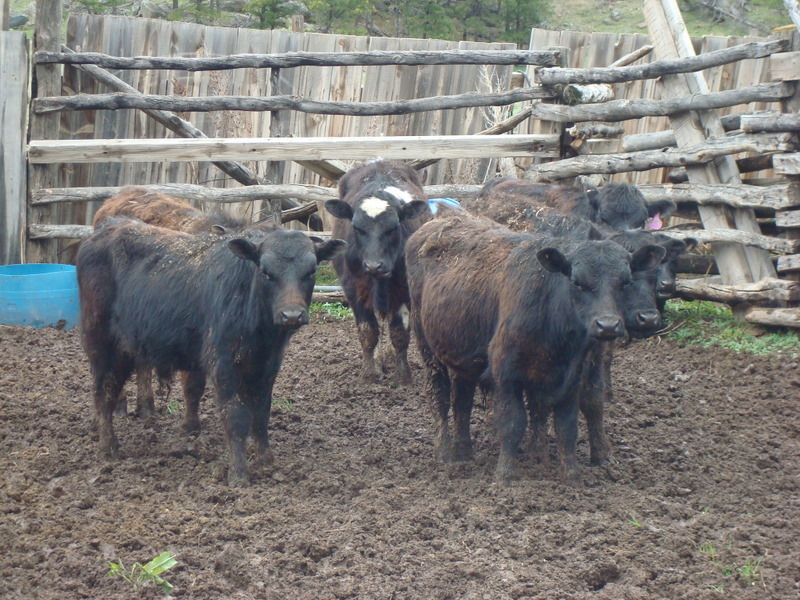 We buy them in the spring, fatten them up all summer and sell them in the fall once they have put on a bunch of weight. Years ago we kept our calves through the winter and then sold them as yearlings but after several years of drought when we were not able to cut and bale the hay we normally would, we ended up having to buy hay. Buying hay at $80 – $100 per ton is expensive so we had to adapt our operation. 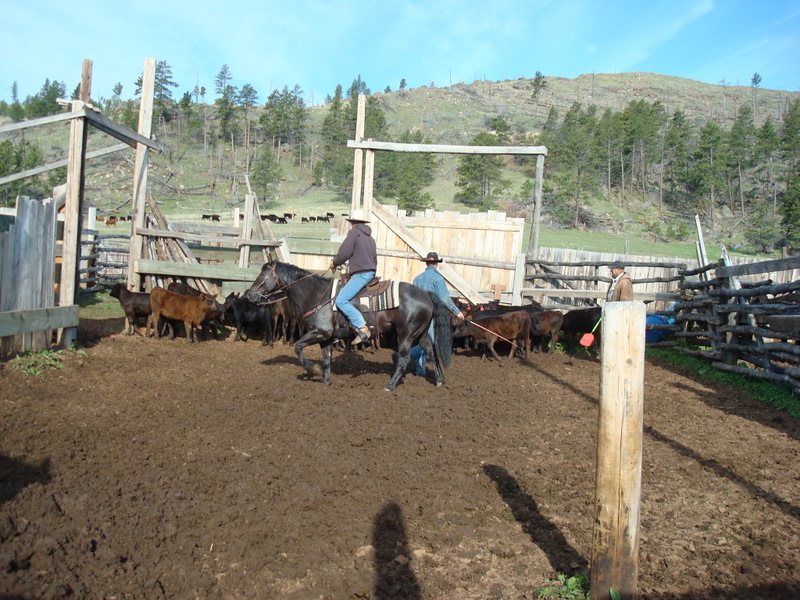 Now we sell the calves in the fall and buy yearlings in the spring and it has worked pretty well. The trick is to buy them skinny & cheap and sell them fat & expensive. It’s the best way to sell the grass in our pastures. Usually we get several loads of yearlings and they are always black or black (with) white-faces but this year we seem to be ending up with an odd assortment of colors and sizes. Of course we have black Angus and black white-faced but we also have one that appears to have blood lines going back to a Holstein which is a dairy breed and even a couple that are Longhorn cross. I’m thinking this will be an interesting summer. Amongst this mixture we also have heifers (females who haven’t had a calf yet), steers (males that have been castrated) and even a few bulls (that after this weekend are now steers). Sorry guys. This is our propane branding stove. 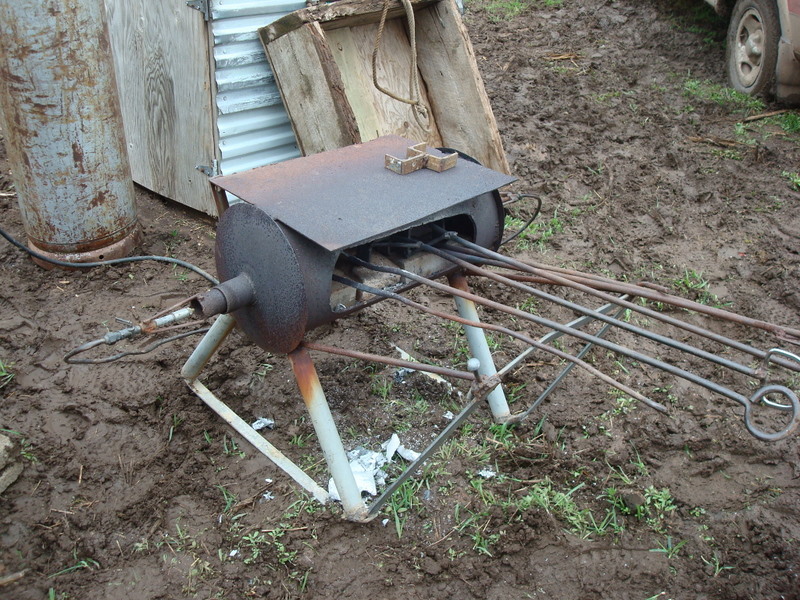 It was built by Hubby and it works well to heat the irons. It has even been used to brew a mean pot of cowboy coffee on occasion – and I do mean ‘MEAN’. It is often said that a horseshoe has to be able to stand upright in the dark, murky brew before it can be considered cowboy coffee but I think it also has to be strong enough to dissolve the horseshoe – at least that’s how strong Hubby makes it. We have at least 3 brandings every spring. One for the yearlings and any cows and bulls we purchase that year, another for the new calves born that year and usually one more small branding in early summer for any late calves that happen to show up ‘after the party’. We have had branding days that were huge parties with lots of people and mountains of food but the ones I like best are the ones where just our family can handle it – maybe with the help of one or two neighbors who happen to show up and decide to stick around. Saturday was one of those days. We hadn’t planned on branding. Silly me – I had mapped out a whole weekend full of stuff I needed to get done. I was even planning on making it to a garden club meeting. It’s been so long since I’ve been to one of those that I’m sure half the members have decided I must have left the country or passed on to the great garden in the sky. Yep, I had stuff stacked on the kitchen table ready to go and a list a mile long of what I needed to do but at 10:30 Friday night our son, Dalton and his wife, Dani called. They were headed our way and would be home in about an hour – that’s when the wheels in Hubby’s mind started spinning. 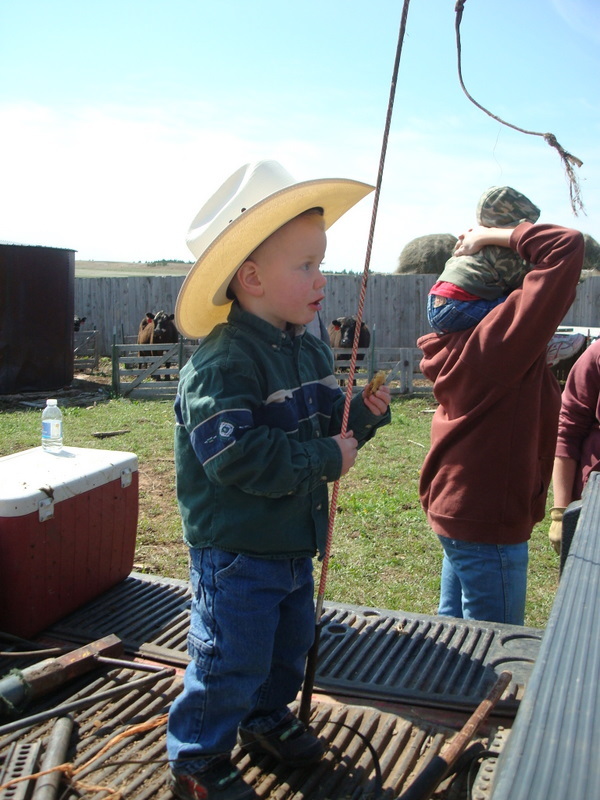 Morgan, our youngest son was already planning on being at the ranch Saturday and any rancher knows that when you have that much help show up you automatically start to think about what you can get done. For us, it was an easy choice. Last week we had hauled home the first two loads of yearlings. 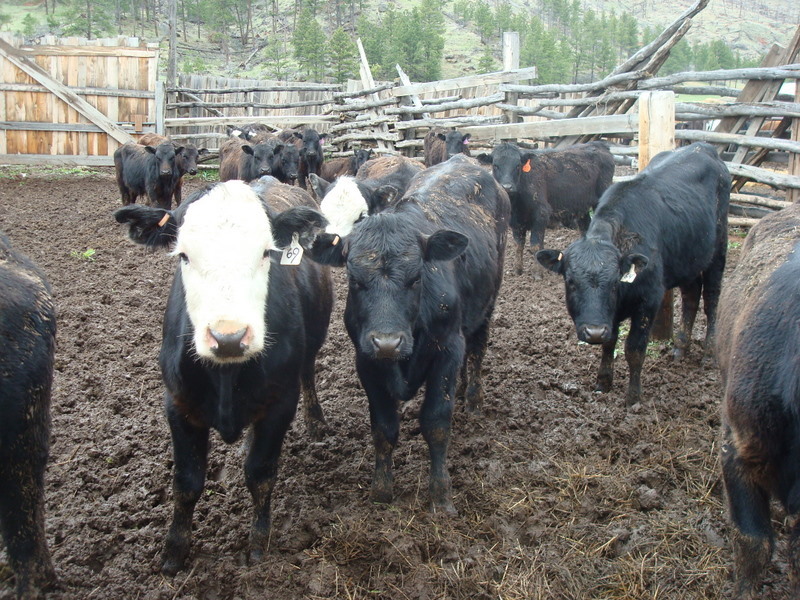 They were in the corrals just waiting for a day dry enough to brand. It didn’t matter that it has rained for 2 weeks straight or that the mud in the corrals is roughly deep enough to bury a sports car to its hood ornament in or that none of the kids knew we were going to put them to work. No, what really mattered was whether or not the rain would stop long enough to let the yearlings hides dry out so we could get a good clear brand on them. 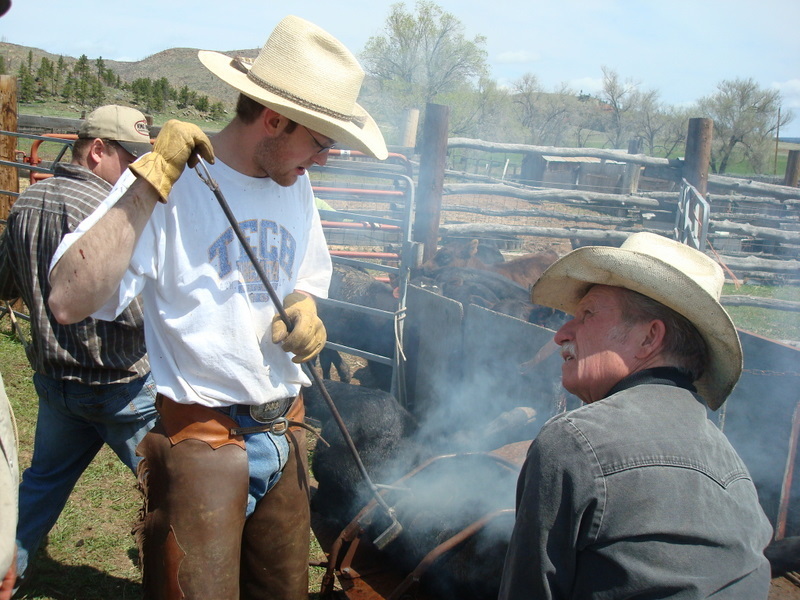 Now I know some people are upset by the thought of branding livestock but since the beginning of ranching it has always been the best way to prove who owns what. 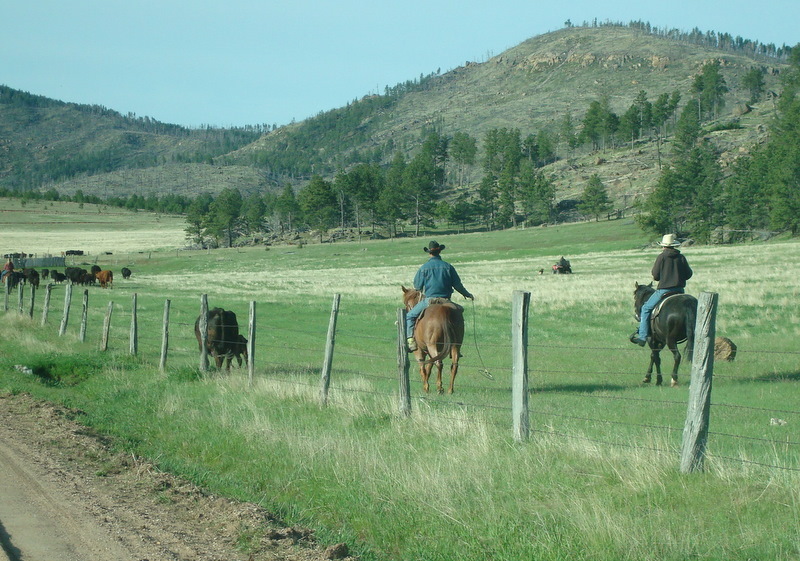 Don’t think that the days of cattle rustling are over – far from it. I talk to people every day who have lost cattle to sticky fingered individuals and without a brand it’s very hard to identify an individual cow, calf or even bulls. One couple I know came up short 12 pairs (cow and calf) on their summer pasture last year. That adds up to over $25,000.00 worth of livestock missing and this is something you can’t buy insurance for. 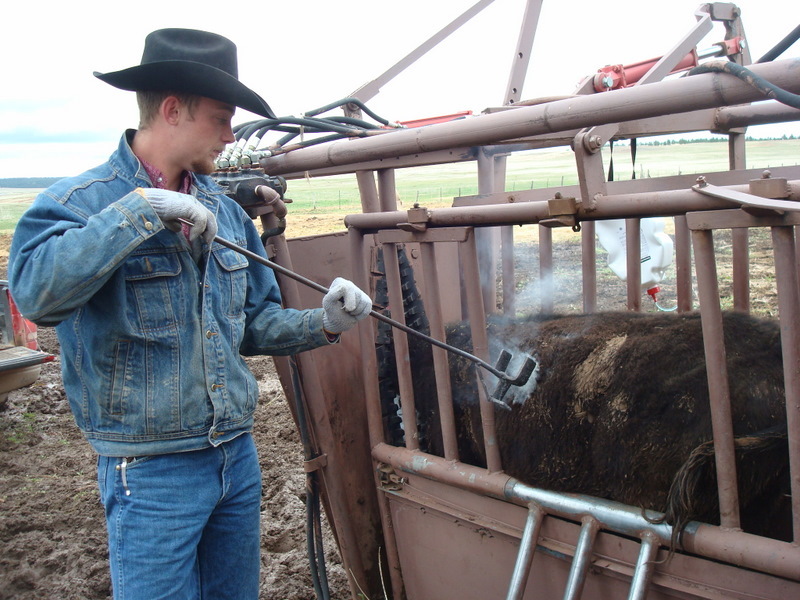 Their cattle were branded but in eastern South Dakota the sale barns do not inspect brands so more than likely that’s where they ended up going. Branding doesn’t stop all rustling but at least it slows down some of it. Since the easiest thing to steal are slick calves (ones that aren’t branded) you might as well just hang a sign around their neck that says ‘Take me – I’m yours’. It’s sad but true. So we brand. As luck would have it, Saturday morning we woke up to a short lapse in the rain so we drug out the branding irons and got to work. Morgan ran the hydraulic chute and branded. 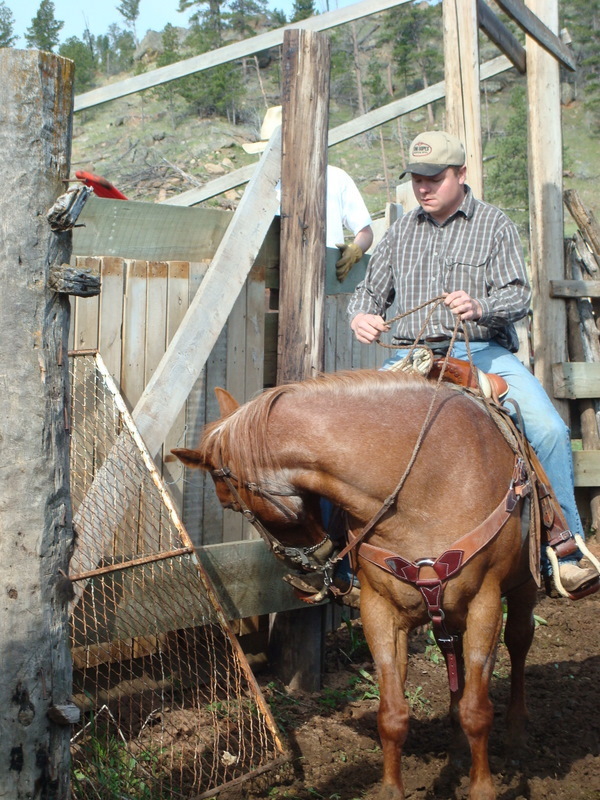 He’s good at running the chute – he misses very few if any and that helps save a lot of time and cussing as you have to gather up the ones that manage to ‘squirt’ through the chute. It ususally takes several tries to run them back into the corral and through the chute a second time. Morgan’s also pretty quick with an iron – the hotter the iron the faster you can get the job done. Dani grew up on horseback but not around cattle so she’s still kind of new to branding but this time she was in charge of changing out all the old ear tags and replacing them with new ones. I think this is only the 2nd or 3rd branding Dani has ever been to but she’s not afraid to try something new. Each yearling received a nice orange tag with a number in the left ear and a treated ‘fly’ tag in the right ear. These fly tags will help keep the insects off of them through the summer. Tagging can be a ‘snotty’ job but Dani is great about jumping right in and getting to work. Dalton, Dan, our neighbor Paul and I usually end up doing whatever else needs to be done – pushing cattle into the chute, vaccinating, applying pour-on treatments for pests, keeping written records, taking photos, running for supplies and in this case de-horning the Longhorn cross steers. 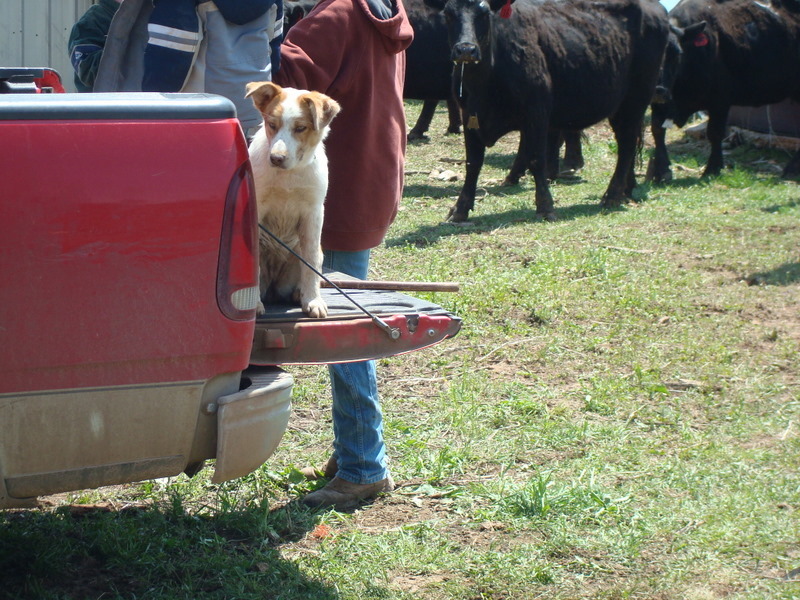 And even Dally – Morgan’s new pup helped out by running cattle in and then staying out of the way while we worked. She’s not even 6 months old but she’s smart and learning quick. Having big crews to help is fun but personally I’ve missed out on a lot on those branding days because my job was always inside – cooking the meal. I’m actually a pretty good cook but I’ll freely admit that the kitchen is not where I want to be. Times have changed and I’ve gotten smarter. Now I prepare everything in advance and as far as I’m concerned, crock pots and slow roasters are a gals best friends. I’m proud to say I have mastered the art of cooking on auto-pilot and I would trade my stove in a heartbeat for the sight of my saddle on a good horse and the smell of burnt hair in my face. Do hoop houses attract lightning? 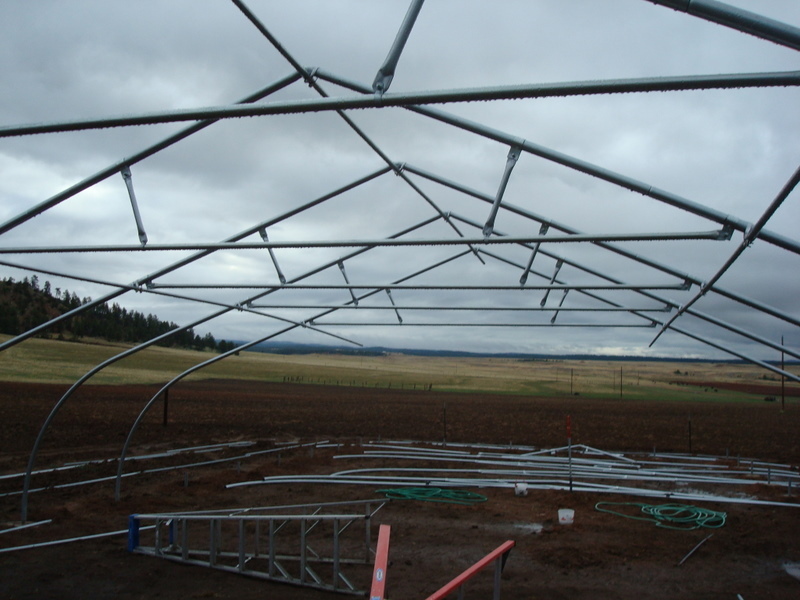 I suppose it was because hoop house construction was still fresh in my mind and it was probably due to all the photos I put in my last post of large metal hoops sticking up in the air that made me think of it but it surprised me that this is something I have never even considered before. Someday while weeding my heirloom tomatoes will I get the shock of my life or will I come home from work to a steaming pile of roasted veggies and melted plastic? Does anyone out there know or even care about this besides me? I’m normally not afraid of lightning although I do have a healthy respect for the power of nature. In fact I love to watch huge thunderheads boiling over the horizon – as long as I’m sitting in the safety of my living room. There’s just something about the extreme beauty of lightning as it reaches down from the heavens above and blows a tree to smitherings that tends to get your attention. Maybe it’s this seemingly random act that makes you suddenly realize it’s true – you never really know when it will get you. I’ve heard lots of stories about lightning including the one about my great, great, great-grandmother. Actually, I’m not sure just how ‘great’ she was – my sister keeps track of our ancestory. Great-grandma was struck and killed by lightning while she stood in the kitchen doorway. That’s the kind of thing that could send you screaming for the basement every time the sky turns dark. Of course if you follow that kind of logic and try to avoid every danger in life we should also be terrified of apple trees as there’s also the story of my great, great-grandfather who was killed at the age of 89 when he fell out of an apple tree. For some reason the sight of an apple tree doesn’t send me into a panic near as much as the thought of what the hell was an 89-year-old man doing up there anyway? Kind of says something about our whole family tree doesn’t it? I honestly believe our family tree is the majestic oak – large, strong and full of nuts! Anyway back to the hoop house question. I have googled it and found no statistics on this but I bet someone out there knows the truth. I ask this because we seem to be in a lightning ‘hot-spot’. We have lived in this house for 5 years and in that time we have been hit by 3 really good shots of lightning. Each time it has taken out the computer (including the modem and the external hard drive), the cordless phones, the TV satellite receivers, several light bulbs and it has fried the ventilation (fart-fan) in the bathroom (since I live with men – this is the item I have missed the most). This has even happened when we have had everything pluged into surge protectors. We’ve had strikes so close that the lady who lives in the fire tower on top of Elk Mountain has called to see if we were OK. She can’t see our house from her tower but she does know where we are. We have no clue as to why we’re so attractive to lightning – not even the TV guy or phone guy can explain it. They’ve told us our house is grounded better than any other place they’ve been – having a retired lineman in the family has served us well. What can I say – lightning loves us. And it’s not just our ranch. Several years ago a local minister was helping gather cattle at the neighbors place when he was hit by lightning. As I heard it the lightning stuck the metal button on the top of his ball cap, traveled through his body, out the zipper in his jeans and into the saddle horn dropping his horse straight down to the ground. The horse was dead with the minister still sitting in the saddle. Our neighbor who was also on horseback a short distance away was blown off his horse and knocked unconscious. When he came to, he stumbled over to the minister, checked for a pulse but finding none made his way back to the house where his wife called 911. The paramedics arrived thinking they were going to be transporting a dead body but instead found the minister alive. He was badly burned and had an assortment of injuries but he was alive. He made a full recovery and continues to preach. I’m just not sure you could get him back in the saddle on a stormy day. Another man I know was struck by lightning while walking across the local Wal-Mart parking lot. I’m not sure why the lightning singled him out of the crowd but for some reason it was his ‘lucky day’. He also recovered but isn’t to fond of parking lots. Lightning is like tornadoes – you hear some fascinating stories – stories of life and death. Even knowing that you can survive lightning doesn’t make me want to risk it. With our history – I think I’ll probably just wait out the storms inside the house (hiding in the basement if necessary). I’m all for trying new experiences but I do draw the line at lightning. So for now I’ll play it safe – but I’ll be sure to let you know how it goes and you’ll be the first to know if someday I come home to the aroma of roasted veggies. 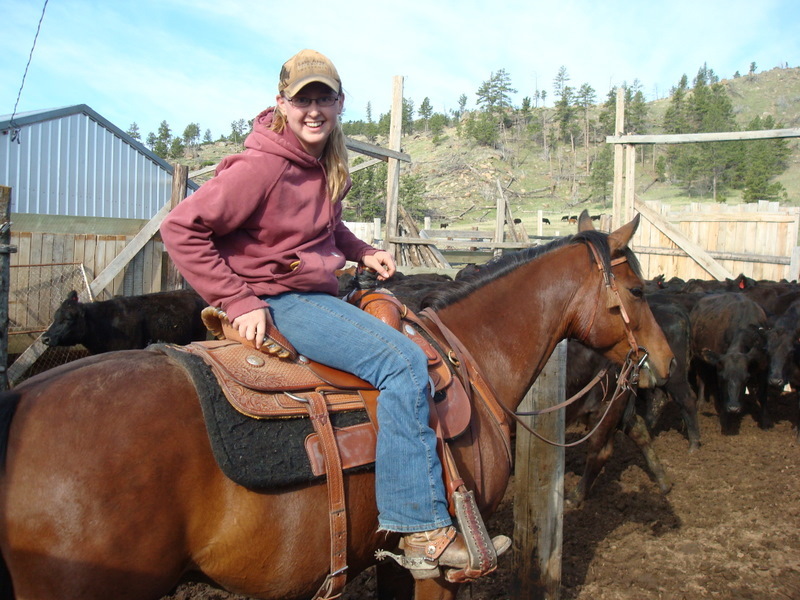 Last Friday and Saturday Hubby and I went to Cheyenne, WY to visit our son and daughter-in-law, Dani who graduated from LCCC’s Equine Science program. 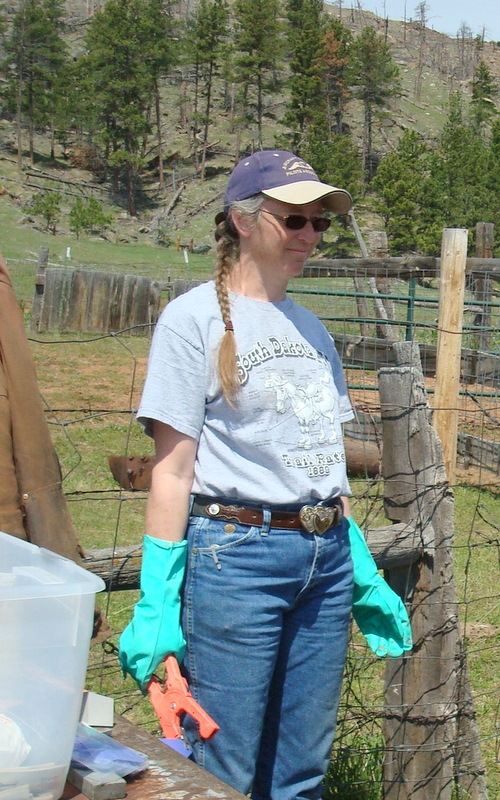 We even got to visit the place where she has been working – training and breeding horses. It was great to get away but by Sunday morning we were back home, rested up and ready to get started on the giant jigsaw-puzzle-soon-to-be-hoop-house in our back yard. Luckily we had done some of the ‘dirty work’ the weekend before. 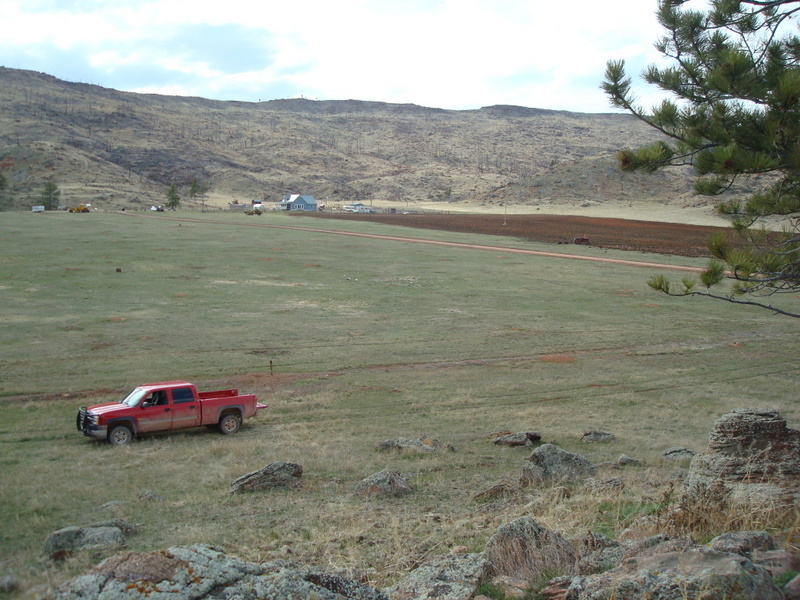 May 12th we started with a fairly level piece of ground and dug 34 holes. Each one had to be at least 2 feet deep and 12 inches around. Check out that great water hydrant in the middle of it all. Water is a wonderful thing!!! Then we hired a professional. 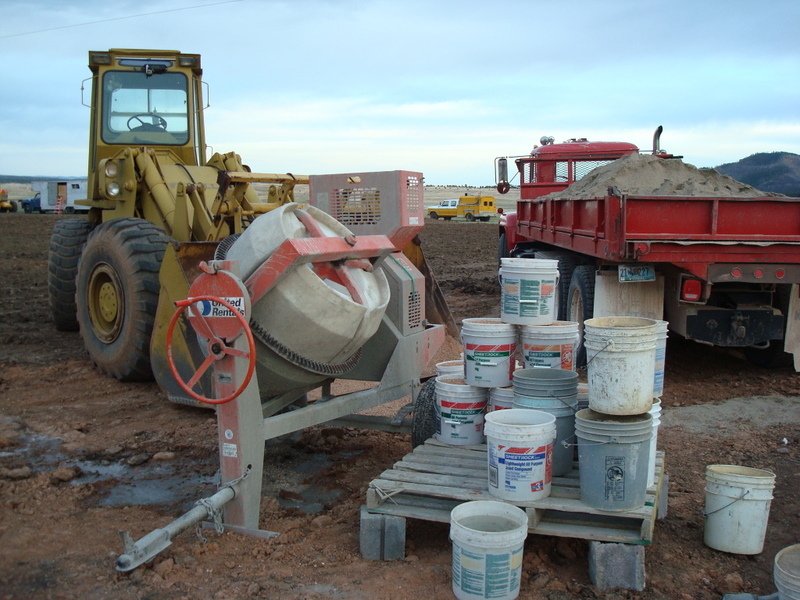 We hired John (the best cement man in the world) and he brought his mixer and a truck full of sand – talk about a rolling mobile beach. Kind of makes you all nostalgic for a pair of flip-flops and a Pina colada doesn’t it? We even used my anniversary gift – the big yellow ‘garden tractor’ on the left. Hubby brought a couple of scoops of gravel for mixing cement with it. Even though it’s my loader I still let him drive it once in a while – if he behaves himself. Yep, some girls just get diamonds and flowers. Not me… I’m a lucky, lucky woman. This is Johns’ ride. 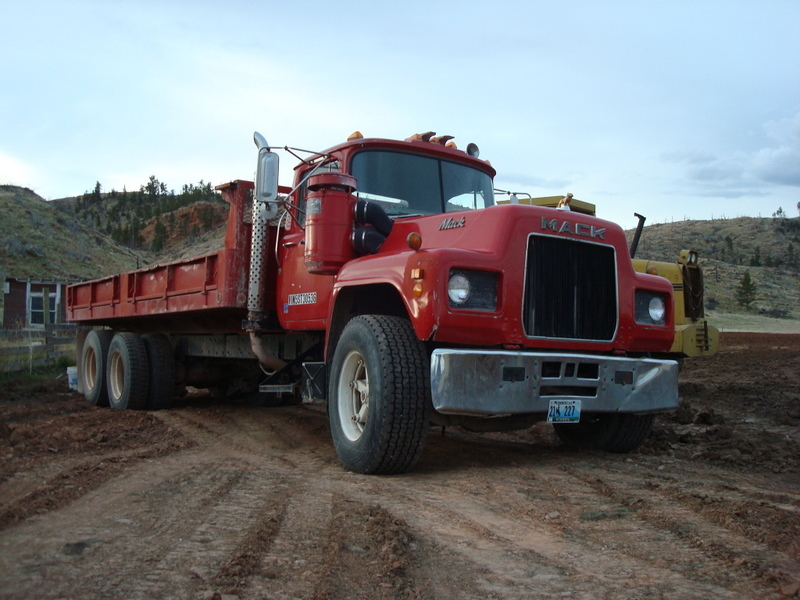 Don’t you just love big, red Mack trucks with shiny chrome stacks and big bumpers? I do. 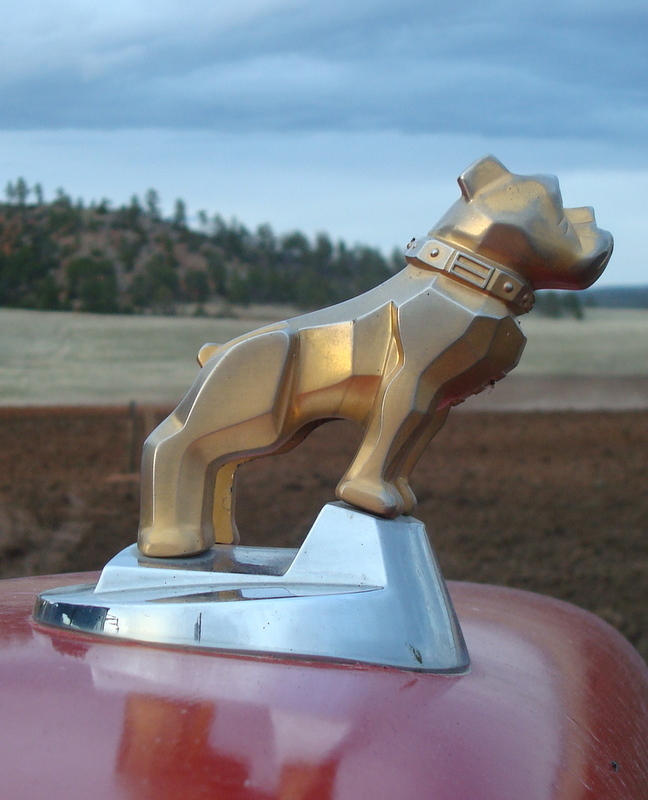 Especially when they have great Mack bulldog hood ornaments like this. But finally, last Sunday, with the ground stakes ready to take the weight of the hoops and a lot of help from our neighbor, Paul we ‘dove in’. We made pretty good progress without too many mistakes. The instructions could have been a little more in-depth but what really helped the most was to lay out all the pieces before we started putting anything together. Actually, the worst part of the whole day was the wind. It started to blow by mid morning and by noon it was really starting to get with it. But we kept on working till about 5:00 when it got so bad it would just about blow us over as we stood on the ladders. It was darn exciting! See the ladders in the photo? That’s the way they looked if you weren’t holding them up. We worked all day and didn’t quite get to the half-way point but now we can see just how big this thing is going to be. I don’t think I have enough tomato plants started. And it doesn’t look too bad for our first attempt. Of course that was last Sunday and as of today (when I took the pictures) we have not been able to do anymore work on it because we had 40-50 mph winds on Monday and Tuesday and then rain ever since. I don’t know about you but patience has never been one of my strong points. 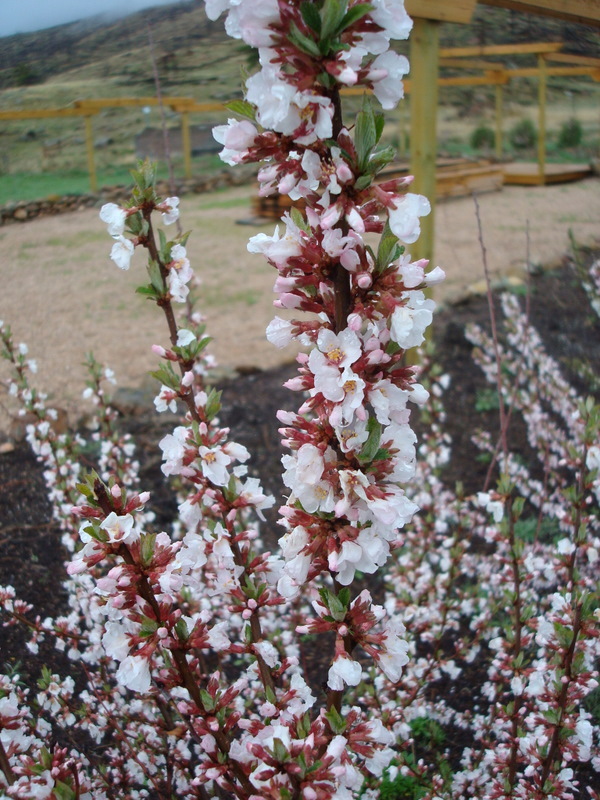 Unfortunately, there’s not much I can do about it but whine and I’m sure you don’t want to hear that so instead here’s some photos of our Nanking Cherry bushes. This is the 5th summer for them and they look great. They’ve had a pretty hard life so far. We planted them 2 years before the end of a 9 year drought and for the last 3 years we have had a horrible infestation of grasshoppers that have totally stripped the leaves and fruit from them but just look at them now. Take that you pesky hoppers! You’ve got to be tough to survive this country – just like the people who live here. We might have some scars and rough spots but once in a while we do put on a really good show. The snows have turned to rain and the grass has started to grow. We’re getting ready for branding (when the last of the girls finally decide to have their babies) and I’ve been working in the garden – even though I still have to wear my coveralls to do it. 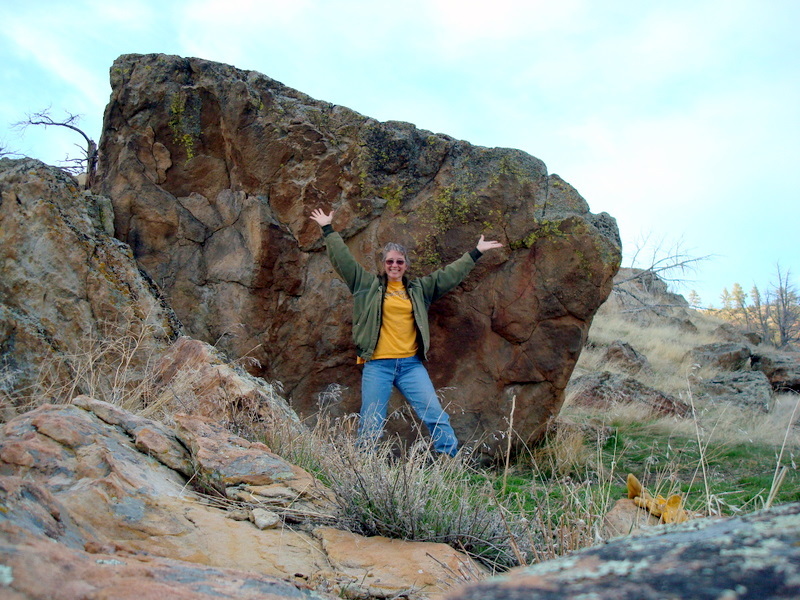 I love rocks and heaven knows we have plenty of them. And since they are abundant and ‘free for the picking’ I can pick as many as I want. 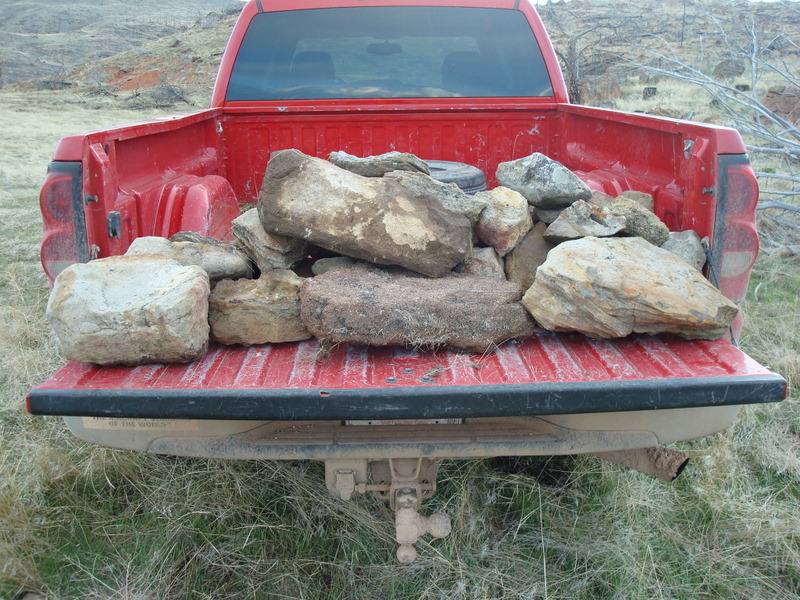 So almost every evening after work, I pull off the driveway and get a small load of big rocks. And what do I do with all these rocks? You ask. I build flower and planting beds like this. This is the herb garden. There are 4 planting beds that roughly form a rectangle. The closest bed is finished and soon the perennials will return and the newly seeded herbs will begin to sprout. 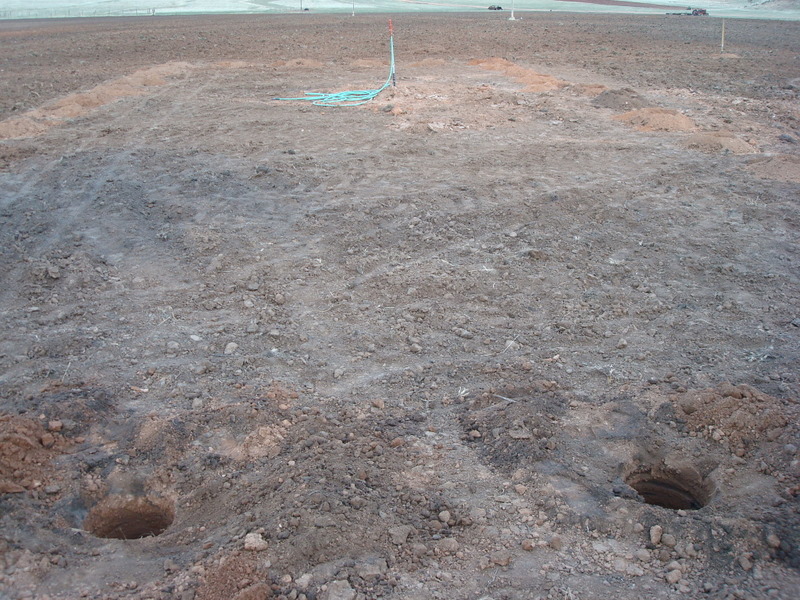 The bed in the center of the photo is enclosed with rocks and ready to be filled with good, black soil. Hubby will bring a couple of back hoe buckets full of soil from the spot where the old sheep shed stood about 20 years ago. This is extremely well-rotted manure that the plants love – unfortunately the weeds do too so there is usually quite a bit of weeding to do the first year. This is the last section of the herb garden. The black spot in the middle of it is where the cook had his fire for the wedding meal. 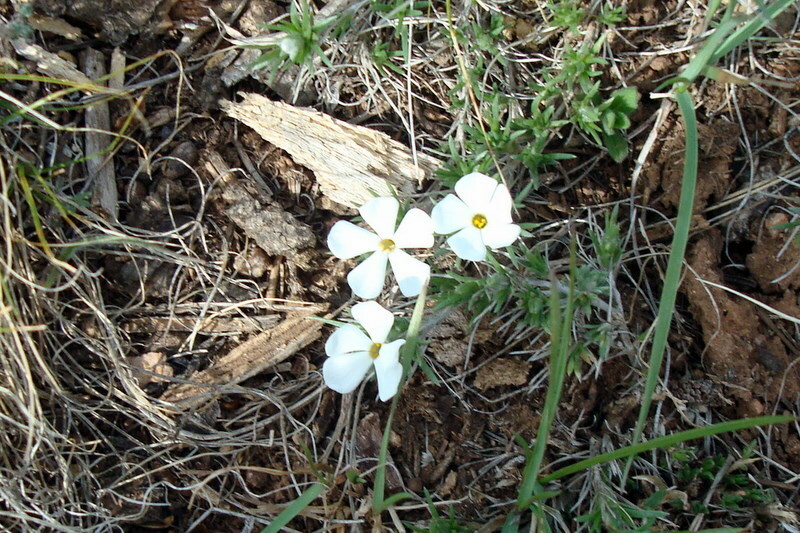 It will soon disappear under a load of dirt. 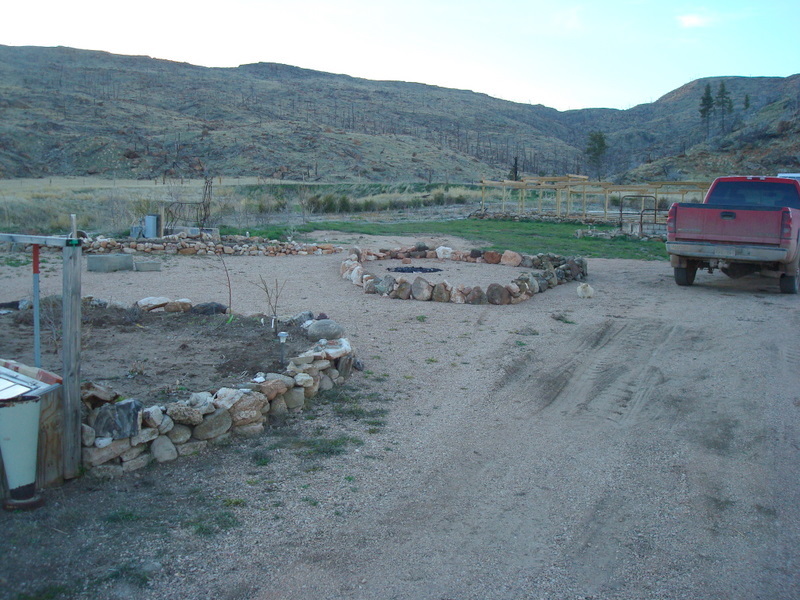 I’m still hauling rocks for a new strawberry bed but I was glad to finish up the herb garden. 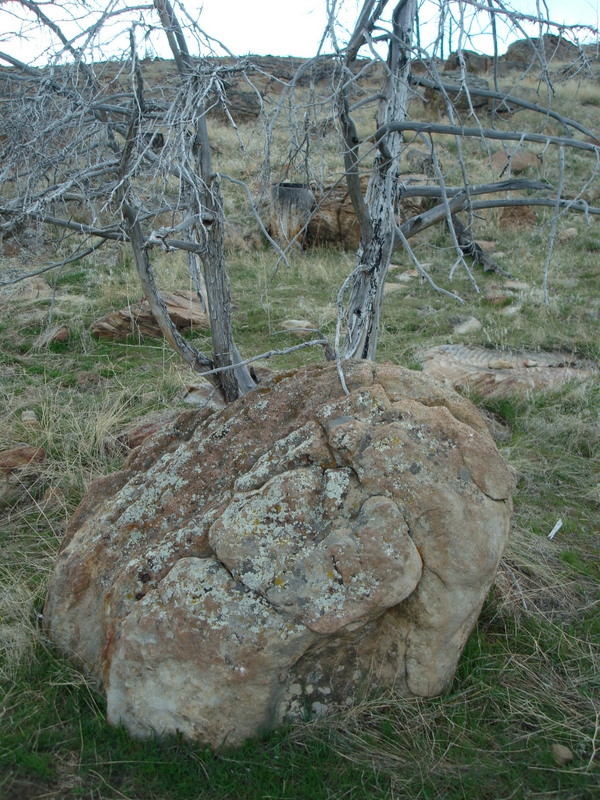 We’ve got a wide selection of rocks at the ranch. I look mainly for rocks that are large enough to stay put when you stack them but still small enough that I can lift them without hurting myself. And you should see my biceps – by the time I got done last spring it felt like someone had installed Arnold Schwarzenegger’s arms on my body – they just didn’t fit the same. I’ve also discovered that when you pick rocks for a hobby no one messes with you. We have some beautiful rocks. I especially love the ones with moss or lichens growing on them. 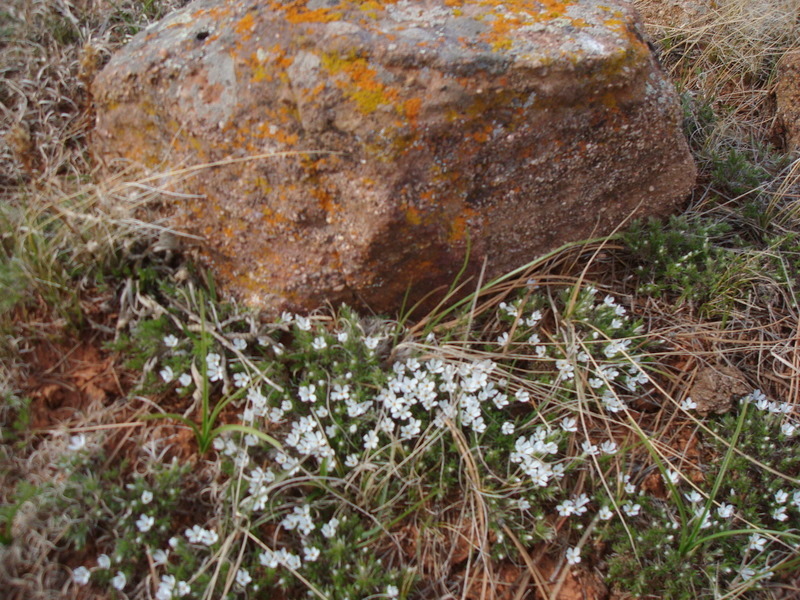 Believe it or not the lichens on this one are actually that color. They almost look fluorescent when the setting sun hits them. 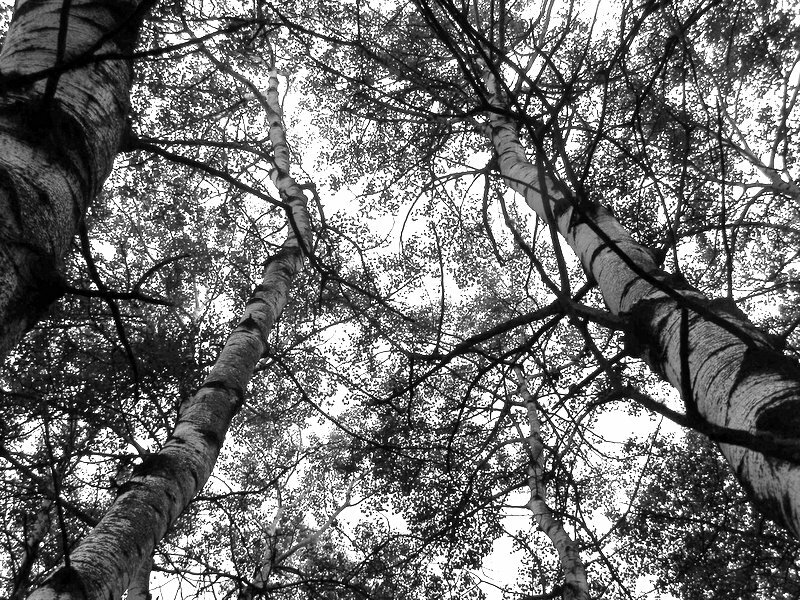 We’ve got big ones with trees growing out of them. And really big ones that I can’t get into the pickup because they are roughly the size of the pickup. 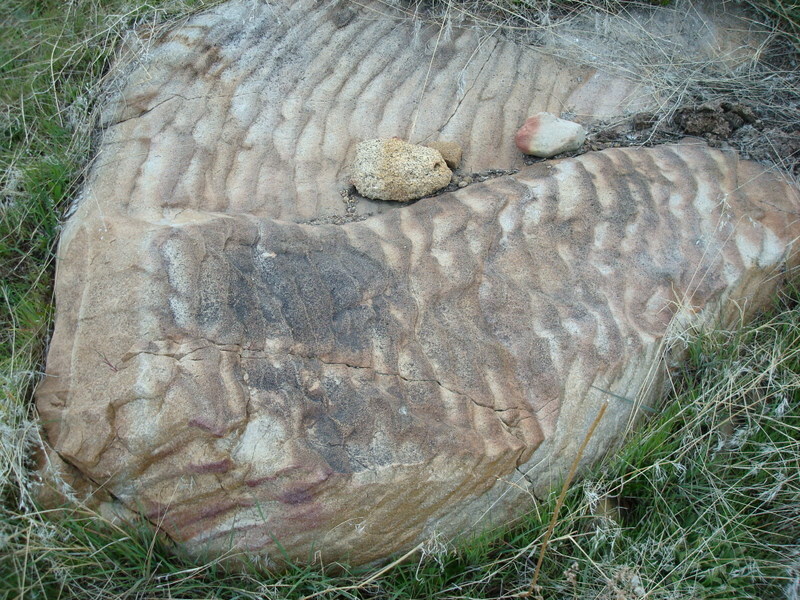 Around here this type of rock is known as ‘Lerverite’ – because you ‘leave-her-right’ where you found her. Not even Hubby’s Tonka Toys can budge it. I actually think it’s holding up the mountain beside it. There are also some rocks that have interesting patterns. You just never know what you will find when your out picking rocks or the views you’ll see. Even though its heavy work I really enjoy it. It’s a great way to take out frustrations after a rough day of work and the garden beds look great. 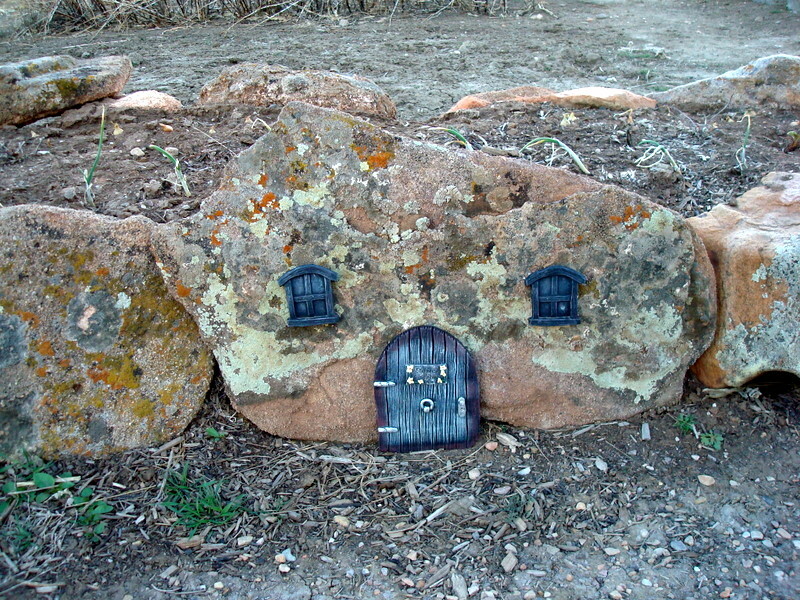 And just check out these cute little doors and windows we found at our Hobby Lobby craft store – they are supposed to be mounted on nails driven into trees but I used Liquid Nails (a really good construction type glue) and glued them onto a couple of rocks. Just too cute! When the neighbor kids found them and wanted me to open the tiny door I told them I couldn’t because when the fairies are home their magic seals the doors and windows shut so humans can’t disturb their sleep and that’s the way you know if you have fairies in your garden – along with their footprints in the foxglove flowers, of course. Everyone knows fairies love foxglove. Every garden should have a touch of magic and a bit of mystery – don’t you think? I only have a short ‘window’ of time from the time the snow and ice melts and the time when it warms up enough for the rattlesnakes to come out of hibernation. On nice days I’ll kick a rock first before I reach down to pick it up and once the rocks start ‘buzzing’ I call it quits until next year – flower beds are nice but they’re not worth getting bit over. Last night, after work, I had a couple of errands to run downtown. Now, if you’ve never been to Newcastle, Wyoming I can tell you right now it is usually pretty darn quiet even on a Friday or Saturday night so you can usually expect to do your errands in the middle of the week without running into anything more exciting than getting stopped by the coal trains that cut through town. So needless to say, I was surprised to be caught in the center of something that people will be talking about all week. It started innocently enough with a stop at the fabric store. All I needed was a small piece of brown fabric to finish a baby quilt for a friend but since they didn’t really have what I was looking for I took my time checking out everything else. As I left the store and crossed the street (making sure to look both ways before jay walking) I was surprised to hear the distinct jingle of spurs running up behind me. Now I have spent my entire life around cowboys and I know from experience that if things are bad enough to make a cowboy run in spurs then it is bad enough to check out what is chasing him – even if you are in the center of town. Turning, I came face to face with a rather handsome fellow – tall, dark and slender in faded blue jeans, large black hat, shiny silver buckle, boots and spurs but there was nothing behind him, that I could see, that was worth running from. For a split second the insane thought crossed my mind that he trying to catch me so I flashed him a dazzling smile which he totally ignored as he ran past me to the back of a ‘well-stocked’ ranch truck. In a single graceful leap, worthy of an Olympic gymnist he landed with one foot on the top of the back tire and propelled himself into the bed of the pickup where he dug into the large stash of tools jammed in around the big red 4-wheeled ATV in the back. I was confused (and still standing there with a stupid grin on my face) but soon turned to look back in the direction he had come from and realized one of the big old buildings on main street was spewing smoke out from around the base of it. By now the cowboy had resurfaced from the jumble of tools in the bed of his pickup (at least I hope it was his pickup) with a crowbar in his hands. Jumping from the pickup he raced back to the smoking building. Years as a Boy Scout leader had trained me for such an occasion. Like a tightly wound spring I sprung into action. I grabbed the fire extinguisher from under the seat of my own well-stocked ranch pickup and followed him back across the street where a small crowd had started to gather. The ‘Crowbar Cowboy’ went to work prying off the wooden front of the building (under the very large glass display windows) exposing a lot of hot, charred wood underneath. Obviously things had been heating up for some time. Two guys from the bar next door showed up to help. The sober one of the two had grabbed the garden hose used to wash down the beer garden and quickly started spraying water into the smoking holes in the foundation while his buddy (who had obviously started celebrating earlier in the day) kept up a steady running commentary complete with several well-chosen 4-lettered ‘sentence enhancers’ for anyone who would listen. The really nice man who owns the hardware store across the street showed up with two brand new fire extinguishers still in the boxes which he ripped opened and started using on the charred wood. A lady from the beauty shop on the other side of the burning building showed up with her hair wrapped up in a towel and a very large black dog on a leash which she quickly handed over to me before running into the smoking building to check on the poor woman inside who was trying to move the large and colorful display of ladies lingerie away from the smoke rising from the vents. Talk about excitement and it just kept getting better! People stepped out from the bar across the street (drinks in hand) to get a better look while vehicles stopped in the street – their owners joining the growing crowd. I’m not sure if it was the smell of smoke or the squeal of sirens but small children and big men suddenly appeared as if summoned by magic while the city ambulance pulled up at the intersection with it’s lights flashing and blocked traffic from the east. Of course – as luck would have it – a very long coal train was passing through town just to the west of us and the sound of its air horns mixed with the clang of the crossing bells, nearly drowning out the scream of the sirens from the fire trucks which ended up having to go around town on the overpass because of the train. Everyone was getting into it. Smoke billowed around us as the crowbar wielding cowboy tore into the charred wood with grim determination and every man with a fire extinguisher or a hose cut loose as if the whole town depended on them. And there I stood – in the middle of it all with a fire extinguisher in one hand and the leash of a very large, black dog (who didn’t know me from Adam) in the other. Man, am I glad I stopped for fabric! To bad I didn’t have my camera – Damn! By then the firemen showed up with lights and sirens blaring and like smoke in the wind the people started to disappear. The cowboy with the crowbar headed back to his pickup and promptly left. Just like the Lone Ranger, he didn’t stick around for a thank-you but quietly vanished in his large Dodge pickup. Never to be seen again. Personally, I think he got the heck out-of-town before someone asked for his name and then sued him for ripping up a building on main street. But that’s just my opinion and since I never saw him before no one can force me to turn him in. I still had a couple of stops to make before I headed for home – anxious to tell Hubby and our neighbor, Paul all the exciting news. I was ready when I stepped into the house and Hubby asked why I was so late getting home. It’s a sure sign we’ve been married too long when my Hubby looked at me with furrowed brow and deep concern in his eyes as he said the first thing that came to mind. Hubby and I are lucky, lucky people. Both our boys are welders. 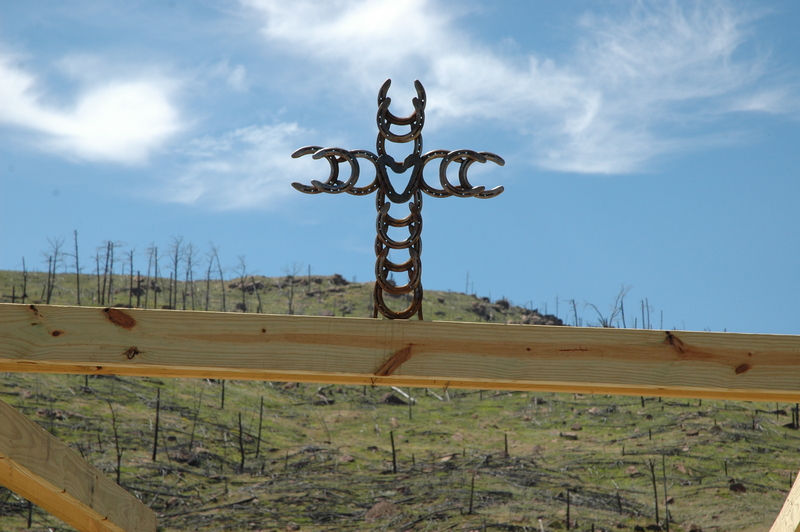 Give them a few tools and an assortment of steel and they can make just about anything. I love this about our kids. Creativity is a wonderful thing. 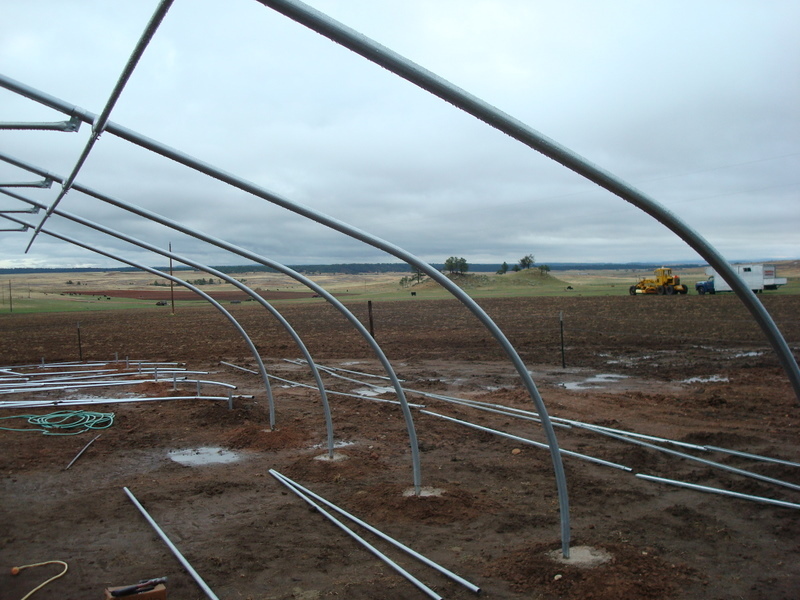 It’s probably been almost 10 year ago when they welded a green bean tunnel for me. It’s a simple design that has held up really well. First we cut long pieces of rebar in half then bent them into shape by stepping on it with one foot and pulling the end up with our hands. Rebar bends easily and one person can do this ‘single handed’. Then Dalton and Morgan welded it together and we covered it with some old woven wire fencing. 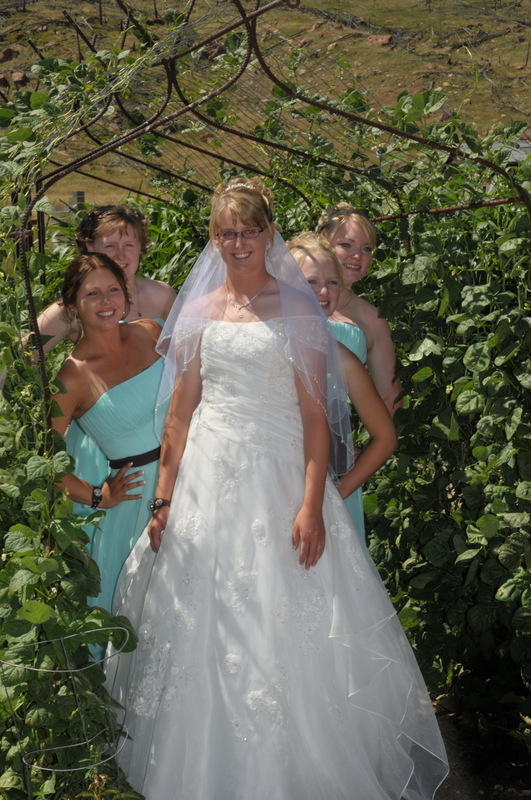 Not only does it look great in wedding photos – it’s also the perfect trellis to grow pole beans on. Of course, the absolutely best thing about it is that I can stand in the shade and pick green beans. And on a hot day – that is a wonderful thing! Both boys are very talented when it comes to working with metal and when our oldest son Dalton graduated from high school he decided to go to a Vo Tech for welding where he graduated at the top of his class. I had to laugh. I’m not sure if Monte had heard it somewhere or if it had come straight from his slightly warped mind but the more I thought about it the more I realized just how true it is – and not just about Dalton but Morgan too. It is amazing to me how they can bend, weld, cut, grind, machine and shape steel – using heat and muscle to mold it into the most wonderful things that you could imagine. Things that will surely outlast me. I’ve watched them repair broken parts from heavy machinery and then gather up a pile of rusty junk and transform it into pieces of art like this. You got to love a man that can do that. but I bet our new daughter-in-law, Dani would tend to disagree with the rest of that statement. With a smile on her lips and a twinkle in her eye she would probably tell Monte he was wrong. It just take the right welder to fix a broken heart. Have you hugged a welder today?